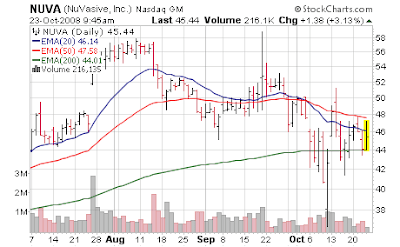 NuVasive (NUVA) reported earnings last evening, and with all the 1x charges I have no idea how to compare to analysts expectations. Usually analyst expectations are on a non GAAP charges, but if so this means NuVasive reported a 21 cent quarter versus 1 cent expectation - so something seems amiss in the analyst expectations (they must include some of the one time charges). Another small healthcare company who raised guidance... we continue to focus on these companies that are executing - the market could care less. An exercise in frustration; honestly it feels dumb to even report all these great news items from company after company when no one cares about fundamentals anymore. NuVasive, Inc. (Nasdaq: NUVA - News), a medical device company focused on developing products for minimally disruptive surgical treatments for the spine, announced today financial results for the quarter ended September 30, 2008. NuVasive reported third quarter revenues of $66.9 million, including $4.4 million of Osteocel revenue, a 73.7% increase over the $38.5 million for the third quarter of 2007 and a 16.5% increase over the $57.4 million for the second quarter of 2008. Gross profit for the third quarter of 2008 was $54.7 million and gross margin was 81.8%, compared to a gross profit of $31.6 million and a gross margin of 82.0% in the third quarter of 2007. On a GAAP basis, the Company reported a net loss of $23.1 million or $(0.64) per share for the third quarter of 2008. ....We believe this will lead to revenue growth in 2009 approaching 40% over our revised 2008 revenue guidance with improving operating margins. Overall, we are extremely well positioned to achieve our goals and reach our interim target of $500 million in sales over the next several years." Just for kicks, and since NuVasive - unlike some other companies - does a nice breakout of GAAP to non GAAP earnings here is how it breaks out since accounting in the US is an art, not a science.